If you have a chunk of paneer with you, paneer bhurji can be prepared really fast. Not much chopping, prep time or cooking time and you have a delicious side with rotis. Paneer is packed with proteins and Calcium so it’s ideal for growing children. Bhurji is one of the easiest dishes made with paneer. 1. Heat oil in a pan and add onion and green chilli. Sauté till onion turns pink. 2. Add tomato. Add all the spices and salt. Cook till tomato turns mushy. 3. Add paneer and cook mixing for 3-4 minutes. 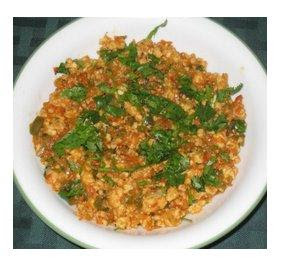 Turn off the heat and garnish paneer bhurji with coriander leaves.